We’re down to the last tip in the 9 Points Of Saddle Fit: tree width. Tree angle, which we discussed in the last segment, and and tree width work very much together. You can’t have one without the other, which is something that many saddle manufacturers (especially those with ‘self-adjusting’ or DIY gullet plates) don’t seem to understand. DIY gullet plates will definitely change the tree angle, but unfortunately won’t address the necessary changes in width over a horse’s withers that are required for a proper fit. If you’re uncertain that the width of your saddle’s tree is correct for your horse, observe his behavior under saddle. If the tree angle is too wide, there may be clearance on the top of your horse’s withers, but the saddle will pinch the sides. It will also hit the reflex point at cranial nerve 11 that restricts movement in his shoulders and makes him unwilling or unable to move forward freely. The horse will raise his head or hollow his back, or exhibit other forms of resistance until the reflex point/nerve becomes numb. If your horse behaves in this manner, it’s possible that the tree width of your saddle is incorrect for him. It is important to understand that your horse doesn’t want to be bad, but if the saddle keeps hitting that reflex point, he almost has no choice: he cannot engage the muscles you’re asking him to engage. One of the most common excuses I hear is that “I have to ride him for a while and warm him up before he’ll listen.” What is really happening here is unfortunately that the horse is being ridden until he becomes numb to the pain! Even though a saddle may look like it fits while the horse is standing still, the angle width may actually change when he begins to move. I know this seems somewhat counter-intuitive, but if the angle is too wide, the saddle will actually sit on the withers once the rider is on the saddle even though it looks like there is more than enough room when the horse is standing still and there is no rider. Too often we see a saddle with a tree that is too narrow for a particular horse. Your horse’s shoulders cannot move freely under such a saddle. Trying to make a saddle fit where the tree is too narrow by adding more padding is akin to wearing another pair of socks to make your shoes fit if they’re already too tight – it doesn’t work! If the tree is too wide, the entire saddle may rock or slip from side to side when it’s being ridden, or the back half of the saddle may twist to one side or the other. (but this may also happen when one side – usually the left – is more heavily muscled than the other, forcing the saddle then over to the other side in compensation). Tree width and tree angle absolutely need to be adjusted together. If the width of your saddle’s tree is correct for your horse, but the angle is incorrect, the saddle will not fit your horse. Conversely, if the angle is all right, but the width is not, the same will happen. Adding or removing flocking from the vertical panels of the saddle will not solve the problem – it is the gullet plate that needs to be adjusted. Sometimes both the width and angle of the saddle’s tree are incorrect for a particular horse. A properly fitted saddle will have a tree that is wide enough and an angle that is correctly adjusted so as to avoid hitting the spinalis muscle. This is also a reflex point that inhibits or completely stops forward movement. When a stallion breeds a mare, he bites her at this reflex point so that she stands still, hollows her back, and rotates her pelvis open. 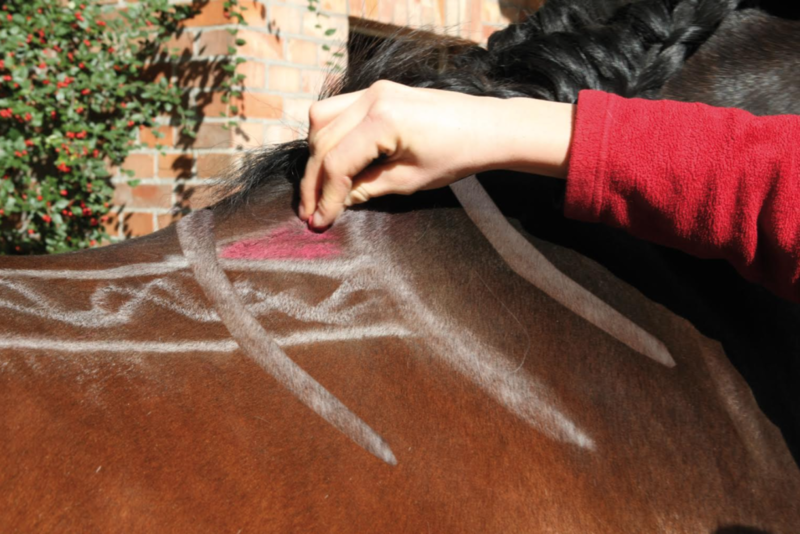 In order to locate your horse’s spinalis muscle, draw a line 4” down from the base of your horse’s withers, and then draw a horizontal line back. The saddle must stay off of that triangle – we call this the ‘triangle of doom’ if you want to get really dramatic about it – but the thought is valid; if you pinch the horse in this triangle, you doom him to pain and you will not move forward (at least not very well or very willingly). Move down 4 inches from the top of the second line and draw a diagonal line to connect the second and third lines back to the base of the withers then back to the top of the second line. This triangle is the area where absolutely no contact should be made. The trapezius, the rhomboid, and the spinalis all insert under this region as well as the nuchal and dorsal ligament system with all of the accompanying nerve ends. This is the most sensitive area of the withers and where a stallion typically bites a mare to immobilize her during mating. Contact us at 800.225.2242 or online at www.saddlesforwomen.com to book your own diagnostic 80-Point Saddle Fit Evaluation™ to ensure that your saddle fits at all 9 points!